For todays lunch box, we are mostly featuring sandwiches, along with some other goodies! Let’s begin! 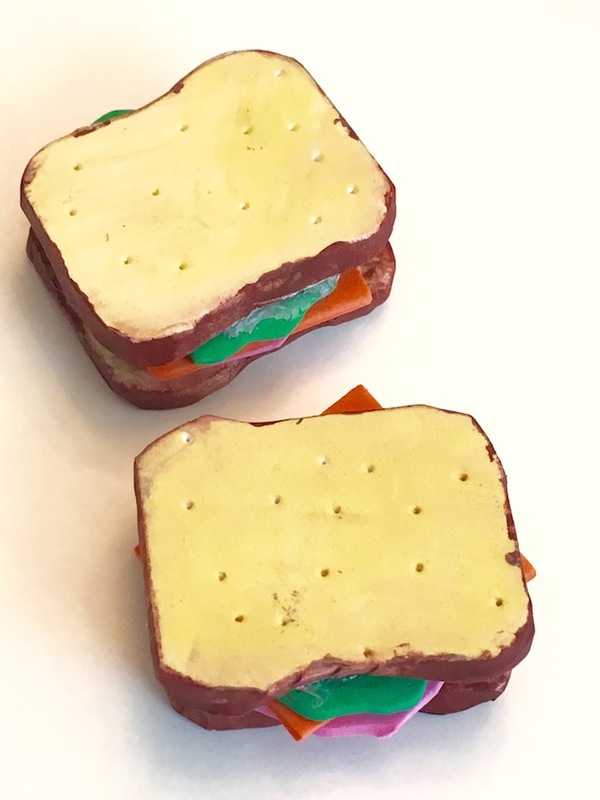 Loaded Sandwich – Cut bread shapes out of thick craft foam. Use markers or paint to colour the front and back of your bread pale yellow. Colour the crust brown. Use a toothpick to make a few marks on the bread for realism. 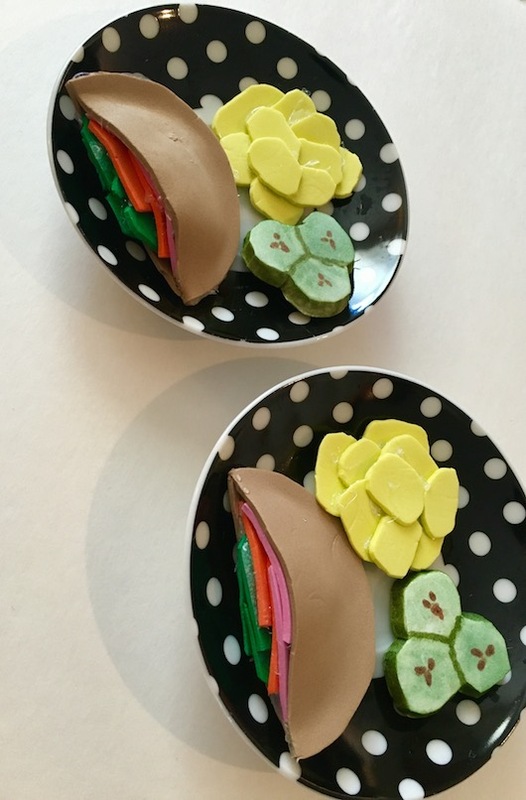 Fillings – Cut out a lettuce shape from green craft foam. Cut a cheese square from orange craft foam. Cut a ham circle from pink craft foam. Stack your sandwich, and hot glue it together. If you like, you can cut your sandwich in half. We chose to leave ours whole. 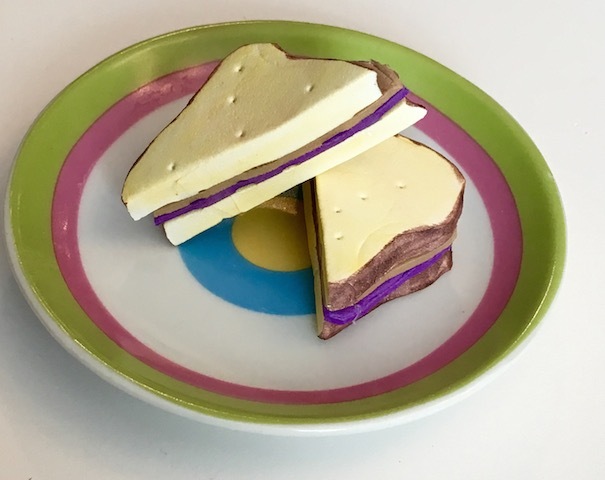 Peanut Butter and Jam Sandwich – Cut bread shapes from thick craft foam. Colour or paint the bread pale yellow. Colour your crust brown. 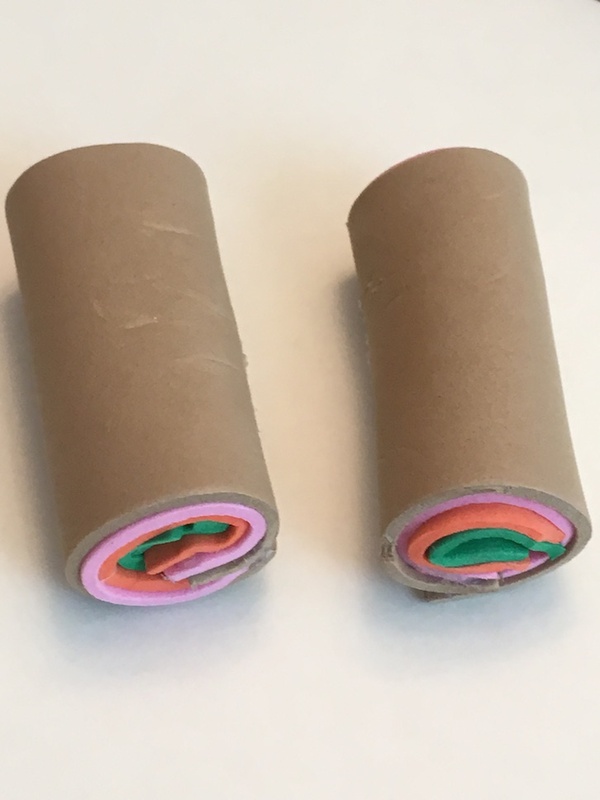 Fillings – Cut peanut butter brown craft foam to size. Cut jelly purple craft foam to size. 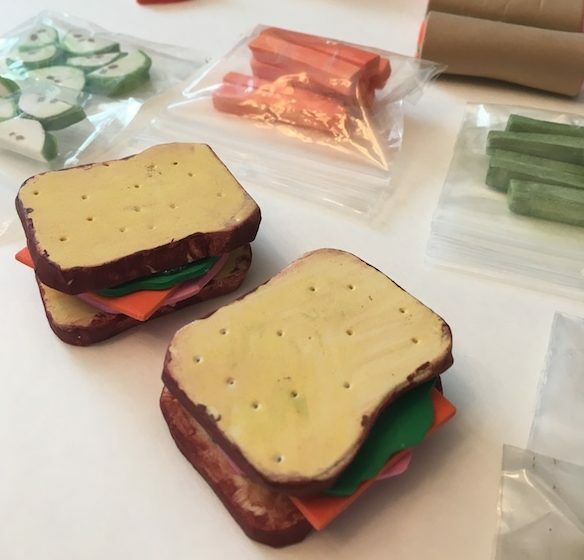 Stack your sandwich, and hot glue the pieces together. Cut the sandwich in half. 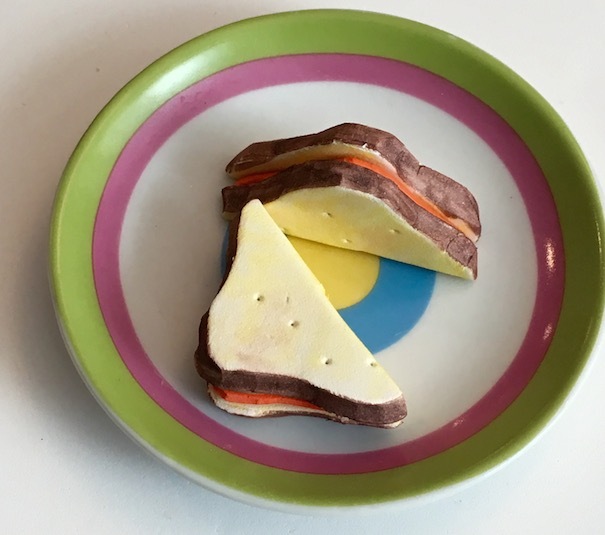 Cheese Sandwich – Do the same as above. This time cut cheese orange craft foam to size for the filling. Hot glue your sandwich together and cut it in half. 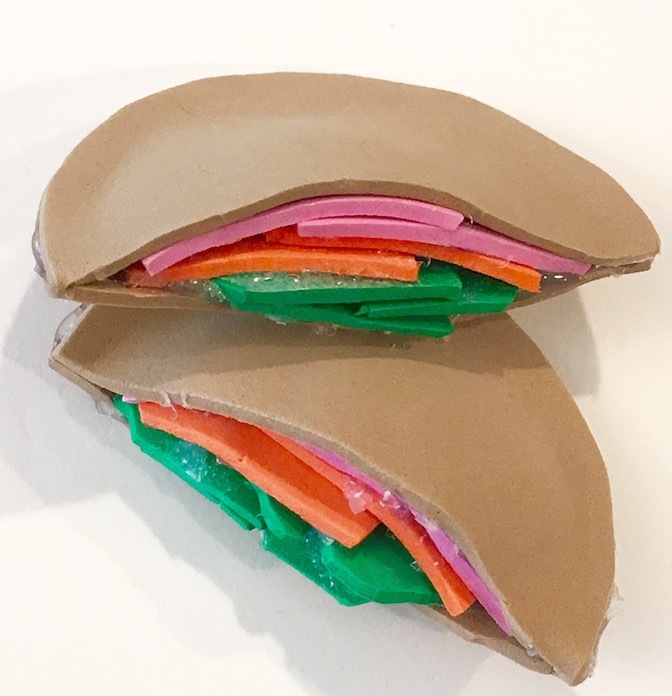 Lunch Wraps – Stack lettuce green, cheese orange, and ham pink craft foam. Hot glue them all together. Then roll it all up with some tan craft foam. Hot glue the ends to keep the wrap closed. You can use whatever fillings you choose. You can also cut your wraps in half on a diagonal if you like. We cut one, and left one whole. Pickles – Cut out the shape of three pickles stuck together from thick craft foam. Paint or colour the edges with dark green. Colour the tops with a lighter green. I just smudged the marker for these to make it lighter. Draw lines between the pickles to separate them. Add brown seeds with marker. Chips – Cut circular shapes from yellow craft foam. Glue together in a pile. 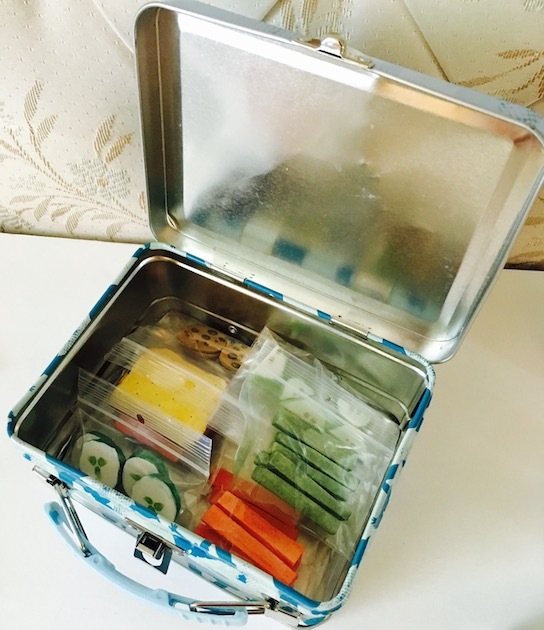 You can put the chips into little Ziploc baggies to throw in doll lunches if you like. Pita Pockets – Use a lid to press a circle into tan craft foam. Cut out the circle. Glue half of the circle closed. Then cut down the centre of the foam circle. Glue the other half of the circle closed to form your pocket. Now stuff with fillings. We used lettuce green, cheese orange, and ham pink craft foam. Hot glue into place. 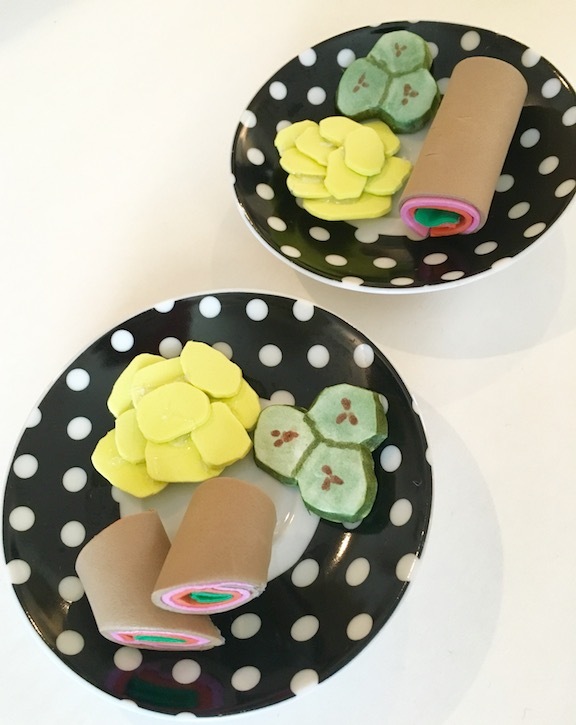 Bag of Cucumber Slices – Cut circles from thick craft foam. Colour the edges with dark green marker. Add light green seeds at the centre. 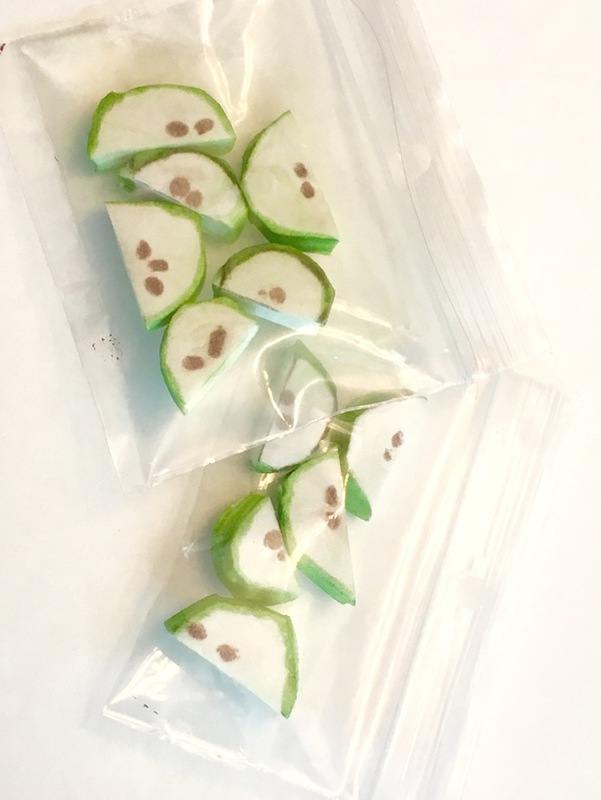 To make a baggie to put your cucumbers in just cut a full sized Ziploc baggie to size, or you can use tiny craft baggies like we did. 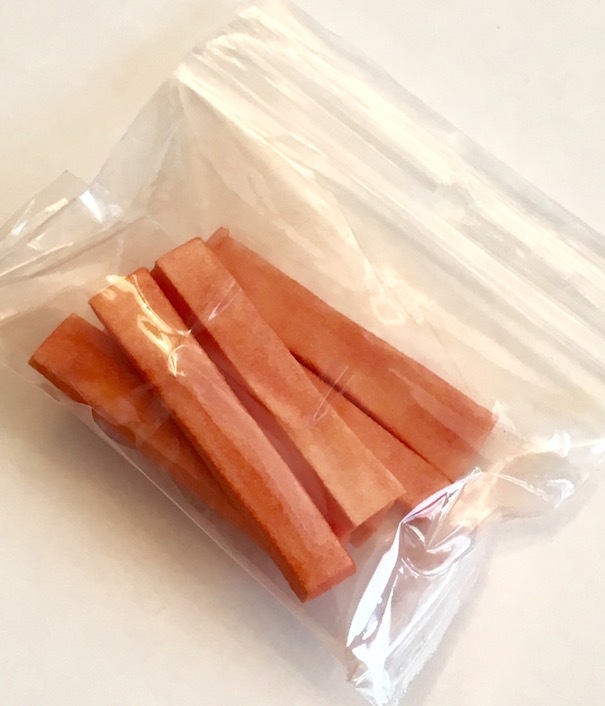 Bag of Carrot Sticks – Using the same method as for the celery, cut strips of thick craft foam and paint or colour them orange. Then use a tiny craft baggie, or seal the edges of a full size Ziploc baggie cut down to size, to toss them in. Bag of Apple Slices – Cut small circles of thick craft foam. Cut the circles in half. Colour your apple peels green. Add tiny brown dots for seeds. 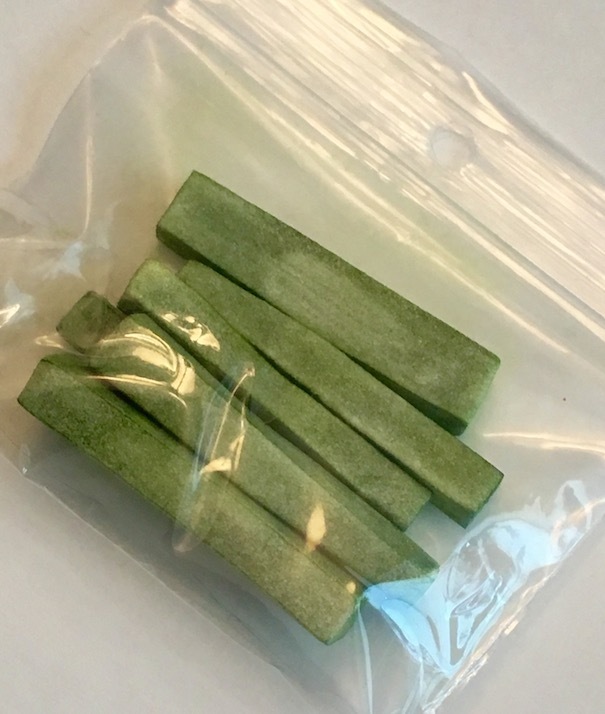 To make the baggie, use tiny craft baggies, or cut a full sized Ziploc baggie to size, sealing the edges with tape. Chocolate Chip Cookies – Cut circles from tan craft foam. 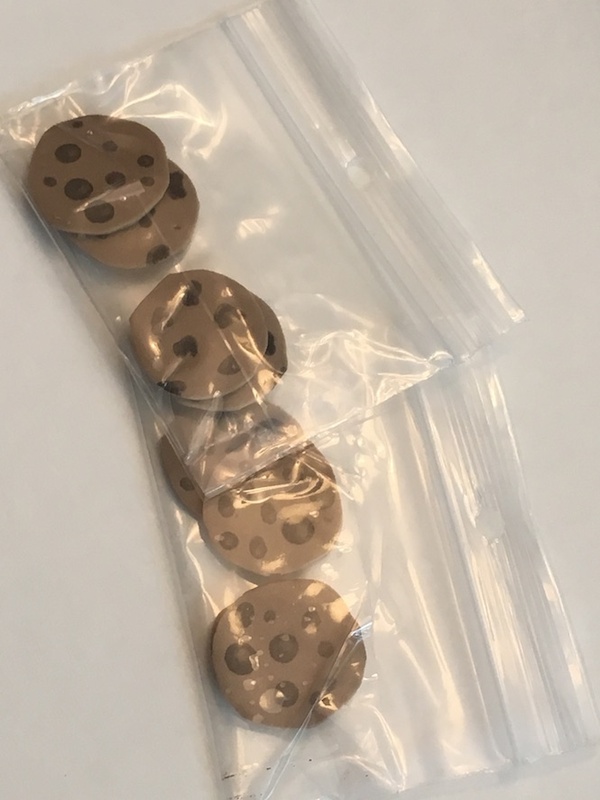 Use a dark brown marker to make dots on your circles for chocolate chips. 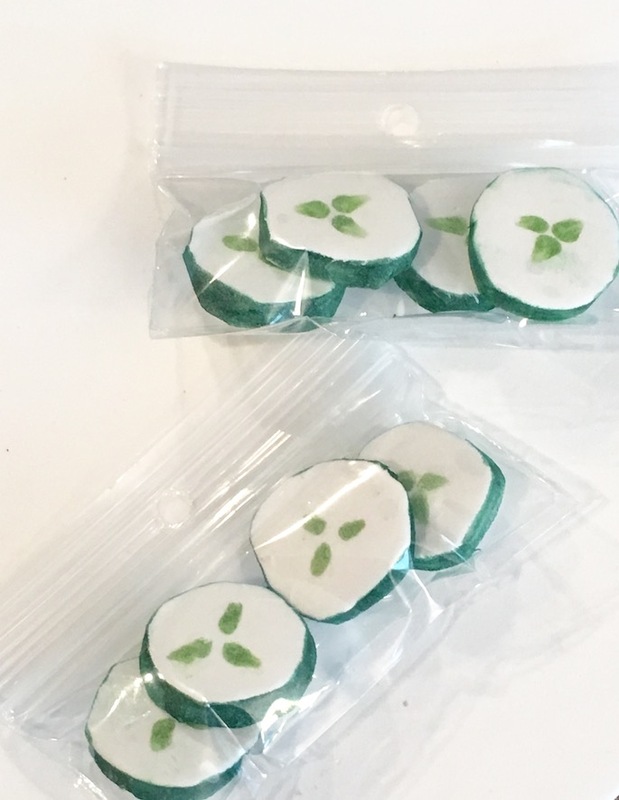 Put your cookies in a tiny craft baggie, or cut a full sized baggie down to size, sealing the edges with tape. 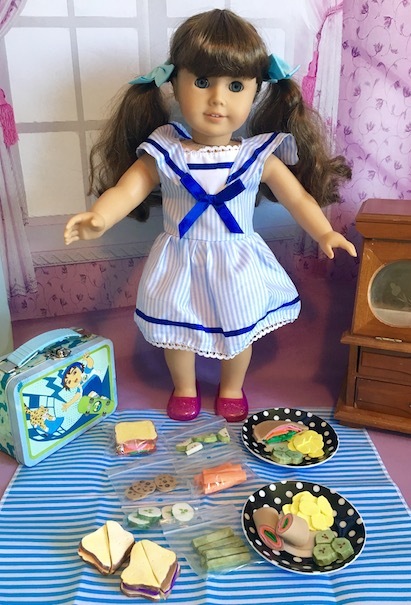 Toss everything you made into your lunchbox, and your dolls are ready to do lunch!! I hope you enjoyed our lunch special! Come on by tomorrow for supper! I promise, you won’t be disappointed! What’s for lunch at your house today? Next > SUPPER FOOD SPECIAL! It’s all cute but the bags of cucumber slices are my favorite!